Introduction by Graeme Phipps: Stuart Foggo is an intern with Birdlife Australia which was previously known as The Royal Australasian Ornithologists Union. Stuart is going to be talking about the Powerful Owl Project which relates to Powerful owls in the Sydney region. I am Stuart Foggo from Birdlife Australia. I am an intern for the Powerful Owl Project which I commenced in April this year. However, I have been involved with the project for 2 years now doing pellet analysis. I will talk about that a bit later. 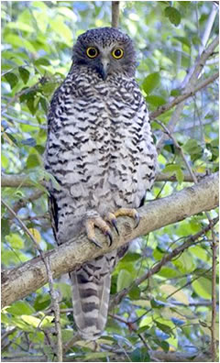 The Powerful owl (Ninox strenua) is the largest hawk-owl in Australia. They are roughly similar in appearance between the sexes. The male tends to be a bit lighter than the female for a couple of reasons, the main reason being that he has got to do all the hunting during the nesting period while the female is stuck in the hollow. He also needs to be nice and big to take down all those possums. He differs from all the other hawk-owl species in that he has a distinctive chevron pattern across the chest. The Barking owl (Ninox connivens) and the Boobook (Ninox novaeseelandiae) have a vertical line pattern and the Boobook is similar to the Barking owl but a lot smaller (half the size). The chicks are emerging at this time of the year so if you are lucky you might see some. They are similar in size to the adult owls but they are covered in white down with brown facial masks. The Powerful owl is primarily found along the eastern side of the Great Dividing Range. They prefer wetter habitats and are not used to the dry habitat that you tend to get to the west. They particularly like to roost in the mesic riverine vegetation. 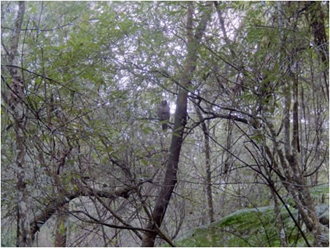 The Powerful owl in the photograph on the left is actually sitting above the creek that runs right under it. The reason they like it is because it is nice and cool and that way they can avoid all of the birds that would more than likely like to mob them and chase them away. They are also found in Mangrove roosts and Coachwood roosts, Cheese trees and Turpentines. Currently in NSW they are listed as "Vulnerable" having been affected by habitat loss, human interactions and interactions with feral species. The Powerful owls pair for life or until one dies and they pick up another partner. Pairs can last for a number of years (up to 5-6 years) and their territories range from about 500 hectares up to 1500 hectares but can be a lot larger than that in areas that have lower prey availability. They can also be quite closely tucked together, i.e. one valley to the next valley. They are usually found singly during the day and during the breeding season. You never see the female from about the beginning of June to the start of September. She won't leave the nest until the young have fledged. During that period you will generally only tend to see the male and you will usually see him roosting with food as well. 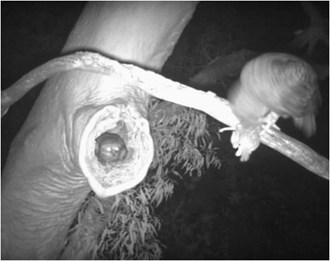 The Powerful owl in the photograph on the right has a Flying-fox. During the day they may be approached at a distance; they can be a bit wary. Some will just sleep right through it and don't really care that you are there, while others will perk right up and have a look at you. They are shy and difficult to observe during the night. During the breeding season they can be very aggressive in defending their nest, particularly at the start of the breeding season and when their chicks have just come out of the nest. Typically you will hear the "woo-hoo" call before the breeding season, probably around March. That is because the male is moving around the territory looking for other males to basically establish their breeding territory. The female does have a "woo-hoo" call as well which is a bit higher pitched than the males. At this time of the year you might hear chicks trilling as well and they are just begging for food and keeping in contact with the adult. Around the nest the male and female also communicate with a number of guttural almost trilling calls and there are also calls that let the female know that the male has got food. You will hear the male and female calling back and forth a lot especially around the early evening or early morning; dawn and dusk. There are certain times during the day and you can almost time it to when they are going to start calling. You will rarely hear them during the night unless it is coming up to the breeding season. The Powerful owl is an arboreal predator; they like to take their prey from the tree tops. They have been known to take prey on the ground and in the water. It has been documented that they have been seen to be fishing before but most of their diet (up to 75-80%) is possums. They are particularly fond of the Ringtail possum. Prey is often consumed the night after capture and the owl roosts with one foot on the prey which is draped over the branch. They also take insects, especially Christmas beetles around that time of year and roosting birds, e.g. Kookaburras, Currawongs, Noisy Miners, Lorikeets and Cockatoos are also taken. Obviously they are quite adaptable in that they will pretty much adapt to what is available. Some that live around golf courses have been seen taking rabbits off the ground and also taking rats in and around Centennial Park. Where they are near Flying-fox colonies they will take them as well. However their primary diet is possums and in the wild they will be taking Sugar gliders and the Greater gliders as well. The Powerful owl requires very large hollows and there isn't a huge amount of them around Sydney. However, when they do find them they will readily breed. The photo on the right portrays a little of their behaviour. The female is just about to lay eggs and the male has brought food to her. He'll call her out and she will come out and he will feed her. Then she will go back in the nest and he will fly off and hunt again. As I said before, the males will start calling around February/March to establish their territory and keep out any other owls in the area. Mating will then occur and about mid May to the 3rd week in June they will lay their eggs. There are usually 1-3 eggs laid (more usually 2 eggs) about 4 days apart and so there is a bit of a gap between the first and second egg. Incubation lasts for 38 days with the young hatching around late August. They will fledge and leave the nest at around 7 to 8 weeks. From the time between the start of June to the end of August the young are fully incubated by the mother. 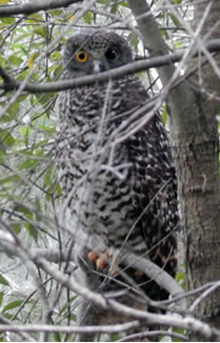 develop education materials for the conservation of Powerful owls and their habitat. We have volunteers in the Sydney region, up on the Central Coast and Newcastle as well as Wollongong. We are trying to understand the ecology of urban owls and what sort of pressures they are facing. From these reports we can identify what is critical for the owls to breed and also survive, and also to communicate with the general public about Powerful owls. The project was started back in 2011 by a volunteer. She spotted a chick in her backyard and she had no idea what it was, the result of which is, she is now doing a PhD on them. 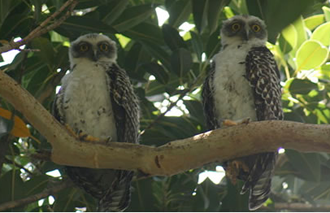 In our pilot year in 2011 we only had about 22 owl pairs to report on but it has grown fairly steadily every year and we now think there is going to be the capacity to monitor around 100 to 120 breeding pairs around the Sydney region. 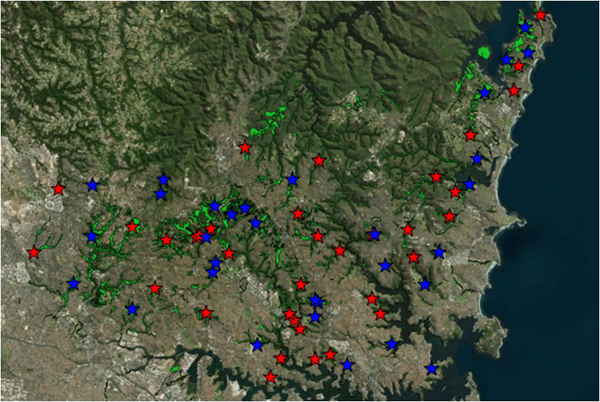 Obviously with our expansion to Wollongong and the Central Coast we are getting more data in from more volunteers. That is one of the benefits of citizen science, where we are relying on the volunteers to collect data for us and owl pellets for us to analyse, and to give us general reports on what the owls are doing in their area. Last year we managed to do some habitat monitoring. As you can see in the image on the right, the distribution of the owls is pretty much in the northern region and they don't really occur throughout the more heavily populated areas. The reason for that is that they really require large areas of foraging habitat in sheltered valleys where they can roost and obviously where all those large hollow trees are located. Some of the results of this monitoring revealed that 81% of the nests that we know of were found within those model breeding and roosting habitats, the intact mesic vegetation they are reliant on which is absent from a large region. The image below is a close up of current nests. The blue sites are current nest sites. The red sites are sites that have been used from 2011 to 2013 and they may not have breeding pairs at the moment. That is due to either the owls moving on or that some sort of catastrophe has happened to one of the pair. One of the things that we do is pellet analysis. 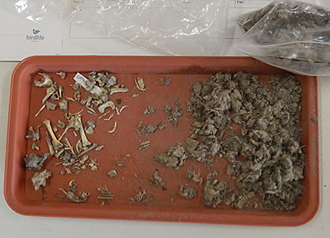 In the image on the right you can see an owl pellet that has been broken up. Because they don't digest bone or fur they tend to just cough it back up and we can use that to identify what they have been eating, how their diet varies from year to year, or at what time of the year. We have found some interesting results with dietary differences in what is being reported compared with what was initially reported. What we are finding is that the owls are taking more Brush-tails than was reported by Rod Kavanagh in 2002 and there is also a seasonal variability in what they take. Flying foxes are only taken in May and October and they are also taking more Brush-tail possums throughout the breeding period; so obviously those are a larger food source and they can easily feed both the male and the female. 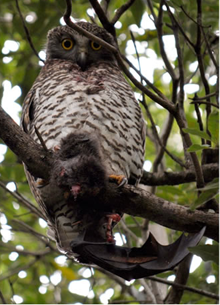 Some of the pressure faced by the Powerful owls is habitat removal but a lot of the mortality of half of the owls that have either died or been put into captivity permanently is due to car strikes. We are probably losing about 8% of the owls per year. This estimate is viewed as an underestimation because that is just from the known breeding pairs. We are not really sure what happens to the young once they leave the care of the parent to when they find their own breeding territory. We know that there is a reasonable population of floating owls, because when one of the members of a pair die and the male or the female may have been lost due to an accident, there can be a quick uptake of new pairing and breeding might happen that year. We don't get too many interactions with feral animals. Any interactions with feral animals are usually to do with chicks. When the chicks are just fledging and not very good at flying, they just fall down to the forest floor and a fox or a cat might pick them up. Most of the incidents are down to car strikes or misadventure; they might drown or fly into power lines as well. We would like to work out how mortality affects breeding success. A lot of what we have is really only reports and we don't have enough data to say how mortality affects breeding success, i.e. whether an owl dying in the area is related to the pair we know about. We don't have bands so we can't really tell; we are usually relying on what the volunteers are telling us. Also further landscape analysis which will allow us to adapt that to finding more pairs – by using habitat data. And obviously continuing pellet analysis which is one of the things that I am focusing on at the moment. Obviously it is an ongoing project so I will be continuing next year. Well, that is about it from me. Thank you for listening. Any questions? Stuart do you think that if artifical boxes were provided, that the owls would then expand within those areas north and south of Sydney? Yes, I think that is something that needs looking into. We have only had one reported incidence of them using a nest box. That was only once and then they moved to a hollow. I think that one of the issues worth thinking about is the problem with the nest box material. It isn't really thick enough and not insulating. I think they rely on that. What if we make one that's thick enough? Yes, that's something to definitely look into. They built a nest box for the Powerful owls that have shown up in the Botanic Gardens. I am not sure what the situation is there at the moment. I don't think they ever used it. Could that be added into the project? Do you think you could get back to us on that, I mean the dimensions of the nest box including the thickness, etc.? I printed a study from one site in Canberra. It is something to look into, so it is obviously the ecological trap where it's good habitat for them but there are no suitable hollows left. It could be it is just something that is missing just like that and that could also impact on the survivorship of the chicks, but where do you go? We have two pairs at Featherdale Wildlife Park. We just got a new male in a couple of months ago that has paired up with a female. Are there any particular characteristics that you have noticed about the nesting hollows that they use that might be typical, e.g. do they always have an entrance spout? Yes they always have that entrance upper facing spout. Some of them have 2 entrances. There is one in Chatswood with a double spout. I think they really need those old Angophoras, they really seem to prefer them, especially around Sydney. Is that what they are using at Featherdale? I don't know what species of hollow is in there but I think we are going to need something else that we need to get up higher. What is the depth from the spout down to the nesting chamber, is it a very deep nesting hollow? I am not too sure about that to be honest. I haven't seen too much work from inside the hollow. If we go back to the image of the female in the hollow that I talked about earlier, the outcome of that hollow was that they actually didn't breed. Something happened around the end of August; there was no sighting of chicks and then cockatoos moved in. A lot of the hollows show that same characteristic as in that photo and obviously they do prefer the Angophoras, but they have been known to use Turpentines and other species of Eucalypts, and generally they would be quite old trees. It would be very important to know the dimensions, because they could be using what's available or there could be a more favoured hollow. Yes. David Bain did some work on that so I could dig up that sort of data, but the only success that we had with the nest box, that is something else to look at. It was only one season that they used the nest box and I think they reared 2 chicks to fledging and then they didn't use that nest box again, I think they moved to another natural hollow. If you are interested in some trials with different boxes, we'd be more than happy to assist. Definitely yes. One of the things that we are trying to think of is where to take the project to next. That is so critically important isn't it? That clear resource; even when you are planting flora with "bush care" and "bush regeneration", etc., that won't be used for owls like this for many, many, many years. I think they would appreciate some of the rainforest species they can roost in and they do like to feel themselves in that type of vegetation. It was interesting that you said that they quickly get a mate when one dies. That to me indicates that there are heaps of them out there somewhere floating around. The floaters are harder to locate because the pairs have their set roosts. Basically you'll find them now in 1 or 2 locations throughout the breeding season and you know where they are, but the floaters, it's really hard to work out where they are because they are not going to call much. With the outsiders before about March we have these playbacks where we just call-back the male and we can say, alright there are owls in this area, but you still search for whitewash and other signs to see where they are. Did you say they chase out other owls or other owls of the same species? Other owls of that species. They are territorial so the males will be calling at the start of the season. So you could still have other species of owls in the same area? Generally what Rod Kavanagh reported was that you could get Boobooks in other areas nearby, but I don't think they would tolerate each other. You tend to get that landscape thing where there are Masked owls up on the ridges and then the Powerful owls are located on the flats or in the gullies. So if you have got a pair of Boobooks at home, don't bother looking for the Powerful owls, is that what you are saying? My other question is have you ever found anything of feral cats in any of the owl scats or any of the pellets? Yes there have been some. Some domestic cats have been identified if not wild ones. There was a report years ago in the local paper for around here where somebody had a little dog, a Chihuahua or something like that, and a Powerful owl came down and grabbed it and then dropped it. There are certainly Powerful owls around here. There has been one at Melrose Park on the golf course. I have seen him on the rooftops as you are driving down and also on the Gordon golf course; there is certainly one there because there are always pieces of possum around. They also take Lorikeets. I wondered what could be killing Lorikeets because there are just bits of them left. Do they feed in the same area when they are not breeding? Yes. All our volunteers say that they tend to move downstream towards the heavier vegetation with the chicks. They won't move to another territory. They will be in their territory for life unless another owl fights them off. The owls sometimes get injuries to their eyes. This one in the photo on the right has damage to his left eye. I don't know whether that is from a fight or just because they crash through trees at night and perhaps get a stick in the eye or something like that. Isn't that interesting? We wouldn't normally release such a bird on the grounds that it would be unlikely to survive because it needs stereoscopic vision. He is obviously doing alright. Yes. He	has got a possum there. That is another sign if you are looking for them. After they catch the possum they will butcher it. They don't eat the guts; they will pull them out and drop them. So if you see possum guts on the ground that it is a good indication that they are nearby. Now I had an evil thought and that was that I have always worried about WIRES taking in so many Ring-tailed and Brushtail possums in our area because I thought, "Hey wait a minute, what if I am a Powerful owl, I need all of those sick, old or injured possums, etc." and it is the scale of rescue that worries me sometimes. We'll alright you are looking after the interests of the Ring-tailed possum. They get released back don't they? They actually don't survive. Their survivorship is extremely low and the studies show that. Likewise with Brushtails, which worries me, because you couldn't get anything more survivable than a Brushtail possum I wouldn't have thought. They eat anything and sleep anywhere! I think part of that is their adaptability, those two possums are pretty much most of their diet, but they will pick off flying foxes and they have been documented to go after Brush turkeys. One of my mates was going to the opera at the Sydney Opera House when he saw one on a street lamp, around the edge of the harbour there. They are in the Botanic Gardens and they have got another pair in Centennial Park as well. That pair did attempt breeding but they weren't successful. He saw it with half of a Black rat and on another occasion it was half a Long-nosed bandicoot. So that was quite surprising, because where did it get the Long-nosed bandicoot? They are really rare in Sydney. So did he get it in the Botanic Gardens? In the Botanic Gardens they would be going after Flying foxes. They would have to be going to Manly or somewhere else and bringing it back. I don't think they would fly that far. What we would like to do Stuart is to give you an honorary membership for a year in order to establish a connection and please connect with Nick on the matter of the nest boxes, because you have got 2 pairs straight away where the nest boxes can be researched and come up with what is ideal for Powerful owls. That is one of the things that I want to look into thoroughly but I am finding there is only so many things that you can deal with. Obviously all of the volunteers are really keen on conserving the owls that some of them have known for 7-9 years now. Okay, well thank you Stuart and thank you so much for coming. What a wonderful insight you have given us. 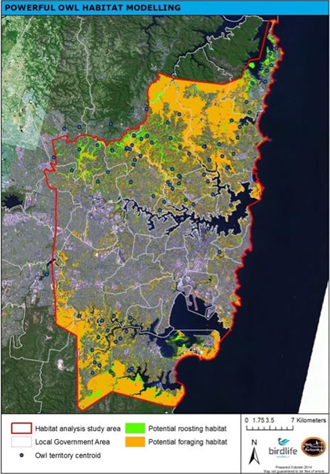 THE POWERFUL OWL PROJECT - Conserving owls in Sydney's urban landscape (David Bain, Rod Kavanagh, Kristen Hardy, Holly Parsons) December 2014.